Coral are tiny animals that arrange themselves on the ocean floor in the tropics (warm areas near the Equator, the imaginary line that runs around the middle of the Earth). When enough corals have accumulated in one place, a coral reef is formed. The dark dots in the map below show these areas, called reefbases. Plastic is a material usually made from petroleum. It is used in everything from electronics to household goods to automotive products to shopping bags and packaging. Since many plastic products are designed to be thrown away after use (like disposable plates and packaging), the trash we produce contains a LOT of plastic. Each year, up to 12.7 million tons (25,400,000,000 lbs!) of plastic makes its way to the world’s oceans. That’s about the same mass as the entire population of Russia (UN 2015). Plastic takes hundreds, if not thousands of years to decompose (break down) – and even then, doesn’t break down completely. This means that the plastic that ends up in the oceans stays in the oceans. A paper by Joleah B. Lamb and colleagues that was recently published in the journal Science highlights the danger that this plastic poses to coral. The paper studied the coral in the waters around four countries (Australia, Indonesia, Thailand, and Myanmar). The Asia-Pacific region, which these countries are a part of, contains over half of all the coral reefs in the world. This region also contains 9 of the 11 countries with the most plastic waste entering the ocean (see table below). 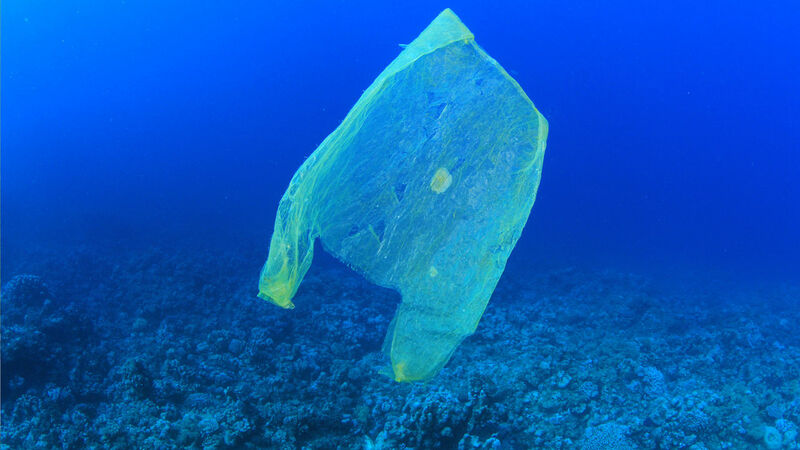 This means that over half of the coral reefs in the world are at the highest levels of danger from plastic in the ocean. Why is so much plastic entering the ocean in this part of the world? The answer is complicated. First, lots of people live in in this region. India, China, and Indonesia alone contain HALF the world’s population. More people usually means more plastic. And many of these people live near the ocean, where the largest cities and the most jobs are. In fact, 73% of the people that live in countries that border an ocean live within 30 miles (or 50 kilometers) of coral reefs. Many of these countries also don’t have laws, guidelines, and mechanisms to reduce plastic use or safely dispose of plastic. This leads to lots of people throwing away lots of plastic in unsafe ways – and that plastic easily and quickly reaches coral reefs. So how or why is plastic dangerous to coral? Chemicals in plastic contaminate the water. Since coral depends on the water in the same way that humans depend of air and food, any contamination in the water can be deadly to coral. In the study, plastic debris was measured from 159 coral reefs. The graph in Figure 1 below shows there is a positive correlation between the amount of plastic entering the ocean and the amount of plastic on coral reefs (when one goes up, so does the other). More worryingly, the map in the middle (B) shows the amount of plastic on coral reefs in 2010. The map to the right (C) shows the projected amount of plastic on coral reefs in 2025. Plastic in the ocean can serve as a place for bacteria to grow and cause disease. These bacteria then attack the coral and make them sick. Similar to how humans can get sick from bacteria (strep throat, for example, is caused by Streptococcus bacteria), so can coral. Many of these bacteria are opportunistic, which means they attack any organism that is weak, sick, or otherwise vulnerable. Figure 2 from the article shows the amount of plastic in different coral reefs in the four countries the authors examined (the blue boxes). In part A, the boxes toward the left shows the disease susceptibility of coral (how likely it is to get sick) when no plastic is present. As you can see, the likelihood of coral getting sick is nearly 0. Part B shows the same thing when plastic is present. As you can see, the likelihood is up to 100%. Since More plastic in water leads to contaminated water that makes coral weak and sick, this leads to that coral being more vulnerable to attack by opportunistic bacteria (which also grows on this plastic), which makes the coral sicker and weaker. This makes coral even more vulnerable to opportunistic bacteria. The weaker and sicker coral is, the more vulnerable it is to get sick from bacteria and eventually die. Why does this matter? Coral is near the bottom of the food chain, which means that lots of organisms depend on it for food. Anything that affects coral will affect every living thing that depends on coral in food chain. Less living coral means less available food for the rest of the food chain. This leads to the animals in the rest of the food chain slowly dying out because there is not enough food. Coral is a vital part of the ocean ecosystem, helping to make sure ocean water stays at a specific chemical composition. Human activity is already changing this composition, altering the delicate chemical balance that all life on Earth ultimately needs to survive. More coral reefs getting sick and dying from plastic and bacteria growing on plastic will change the ocean even more, and do it much more quickly. Ultimately, the ocean’s chemical balance will be changed so much that current ocean life will no longer be able to survive. If ocean life can no longer survive, it will only be a matter of time before all Earth life can no longer survive.